Elaine’s gift for teaching is well known in Hollywood and Broadway. Elaine has recently coached Hollywood stars such as John Travolta and Michelle Pfeiffer for ‘Hairspray‘ the movie along with Richard Gere, Catherine Zeta-Jones, Renée Zellweger, and Queen Latifah for the Oscar-winning ‘Chicago‘. Recently Elaine also coached Ellen Degeneres in a live segment on her hit talk-show ‘The Ellen Degeneres Show‘. As a Broadway coach Elaine trained the singers in the lead roles of Broadway hits ‘Hairspray‘, ‘The Producers‘ and ‘Mamma Mia‘ and ‘The Sound Of Music‘. The diversity of Elaine’s career extends to the individuals she trains. Although she has worked with some of the most musically talented of a generation, she also brings out the best performance from those who are not known for their musical talents. Comedians, actors/actresses and dancers alike come to Elaine to find their hidden musical. Also, record labels such as Universal, Capitol/EMI, Sony/BMG and Virgin send their artists to Ms. Overholt where they learn to protect their voices and develop stamina and style. Elaine has the ability to coax “magical” performances from every type of singer. Her success is certainly due to her passionate ambition to understand the human voice and pass that knowledge on to her students. Whether it is onstage, in the studio or on the road, Elaine drives her students to connect with the unique and powerful voice that is in every one of us – our ‘big voice’. 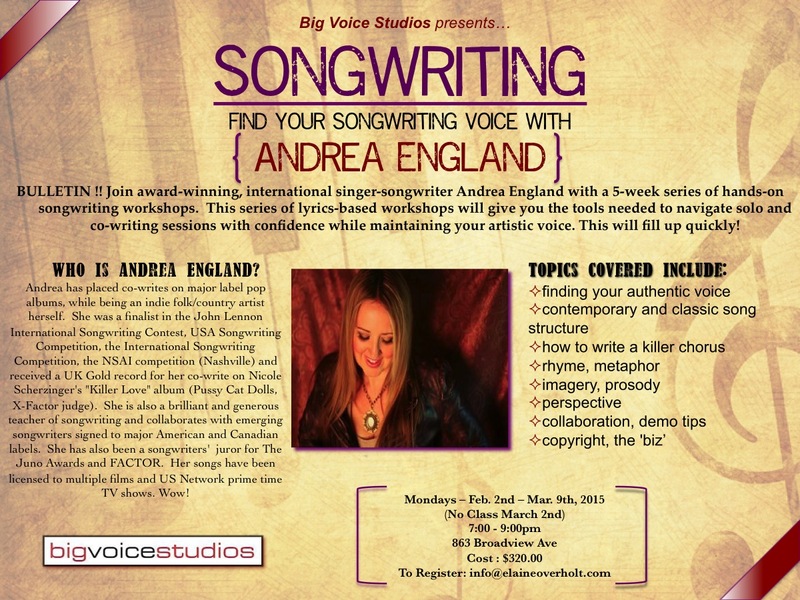 This entry was posted in Gigs and tagged Songwriting Voice Andrea England Elaine Overholt Toronto Singer. Bookmark the permalink.